It’s time for another Harry Potter episode! 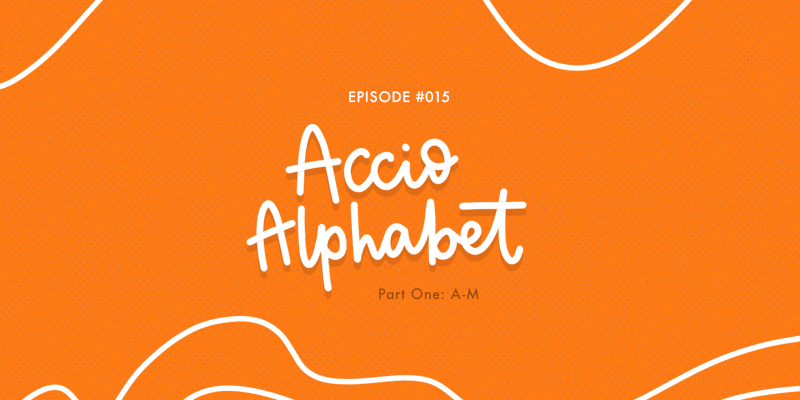 In this episode, we run through the alphabet and share some of the great aspects of the wizarding world for each letter. Keep listening to find out which creature was chosen for C, how many things we could think of for J, and enjoy possibly our longest running inside joke ever. And don’t worry; we’re only talking about A to M today so let’s get straight into it. Each episode of Rants and Reviews we’re going to be sharing what we’re currently reading, so you can discover our favourite genes, add some books to your TBR pile, and hear us rave and rage about characters, plot, setting and more. Sophie is currently reading A Dream of Italy by Nicky Pellegrino, Vox by Christina Dalcher, and Divergent by Veronica Roth via audiobook narrated by Emma Galvin. Anjali has just finished Four Dead Queens by Astrid Scholte and currently reading The Hobbit by J.R.R. Tolkien, the BBC Radio 4 Dramatised version, audiobook. This episode’s show notes are going to be slightly different, as we don’t want to give away all the things we’ve chosen for each letter of the alphabet. But we thought we’d give you a bit of a taster as to what you’ll hear when you listen. What we choose for each letter can be anything from Harry Potter; so characters, places, items, classes, creatures, sweets, shops, etc etc. If we were choosing a character for our letter then we would choose them based on their first name not their last name so we wouldn’t have double ups. We can have shout outs to other things that we like that didn’t make it to the top of the list. (10:25) Anjali kicks us off with A, her logic being ‘Anjali’ starts with ‘A’, and as does the alphabet. But who or what does she pick? (19:30) Sophie has D, and while we do talk about Dobby for a good deal of time, the majority of our discussion for D is actually around House Elves … a joke that ends up running through the entire episode. Enjoy. (40:42) Do you know how hard the letter ‘I’ was? So difficult. But Anjali manages to have one top item and then three shout outs, despite her struggle thinking of things. (49:44) While Sophie has a few options as number one for L, she decides on a character who we don’t actually know too much about, but to whom we can thank for pretty much the entire story. Can you guess who it is? (52:25) Anjali ends the episode with the sass queen herself for M (and if you’ve been listening for a while then you’ll know who it is! ), with some shout outs to the Monster Book of Monsters, Mad-Eye Moody, and of course, magic. That’s all for now folks! But don’t worry, part 2 will be coming at you before you know it. Feel free to send us suggestion for N - Z or try to guess what we might be choosing. Send us a Tweet and let us know! Until next time, happy reading! Find us on Twitter and Instagram. Subscribe on Podbean, acast, Spotify and iTunes or your favourite podcast listening platform. A Dream of Italy by Nicky Pellegrino, Vox by Christina Dalcher, Divergent by Veronica Roth via audiobook, narrated by Emma Galvin, Four Dead Queens by Astrid Scholte, The Hobbit by J.R.R. Tolkien, the BBC Radio 4 Dramatised version, audiobook, and the Harry Potter series by J.K. Rowling.